Waking up to find your yard or driveway buried in snow is not the best way to start the day, but it is a reality for Canadians. Keeping up with winter can be tough but with the right help, it doesn’t need to be a chore. Slips, trips and heavy lifting can be a thing of the past with our Hamilton snow removal and salting. Everyone loves the idea of a mild winter. Warm days, chilly nights and just the right amount of snow might be the dream, but dreams don’t always come true. For property owners in the area, winter means dragging yourself out of bed first thing in the morning to shovel in the freezing cold. A heavy load of shovelling can throw out your shoulder, sprain and arm or pull your back – and that is not even considering the threat of ice. Save yourself the time, aggravation and advil of a snow storm with our Gorillas. There are a few tried and tested ways to carry out a proper Hamilton snow removal and salting, but the best is to be prepared. 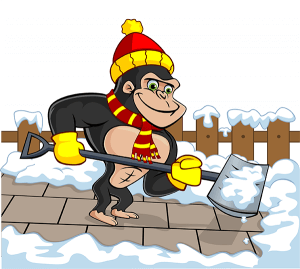 Monitoring weather patterns allows our Gorillas to plan ahead to schedule, organize and tackle your Hamilton snow removal and salting. Knowing the quirks, dips and grooves of your property is an important part of proper maintenance. Weather changes at the drop of a hat, which makes it difficult to plan ahead for melting and re-freezing. 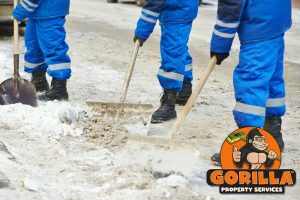 By keeping track of incoming temperature drops, and working with our clients, Gorillas can salt your space in the most effective way. Sprinkling a bit of salt here and there across your sidewalks or driveways might seem like an obvious solution but it is not as efficient as you might think. Luckily, our Gorillas have plenty of practice in making the most out of our salt supplies. Our Gorillas know that schedules fluctuate and that is why we offer 24/7 emergency call-out services. If you need to have your snow cleared away, but it falls within the late night hours, our Gorillas are masters of discretion. Services can be carried out quietly by hand or made to fit larger areas during the daylight hours.